Fancy a swim in the Yarra River? Watercraft regulations make it illegal and water quality makes it questionable - especially after it rains - but a not-for-profit group wants to change that by building a floating swimming pool on the river's edge that would cost at least $6 million. The Yarra Swim Co has released a concept design for the pool it suggests could be built on the banks of the Yarra next to Enterprize​ Park, where Melbourne's settlers moored their ship in 1835. The concept was released on Thursday night as part of Australia's Venice Biennale Exhibition, opening this week. The group last year pushed to revive the historic Race to Princes Bridge, a swim competition that ran from the early 1900s to the 1960s, and again in the late 1980s. It argues that waterway pools are a growing concept globally, with plans under way for New York and London. A similar proposal for a swimming pool for the Thames in London. The architect behind London's proposed Thames Baths, Studio Octopi, produced the concept design with Yarra Swim Co. It includes a 25-metre lap pool and a smaller children's play-pool within a planted, floating pontoon. The concept, which engineers Arup have also helped develop, would include locally developed technology allowing river water to supply the pool. Cost estimates for the pool's construction are between $6 million and $8 million. Andrew Kelly, the Yarra Riverkeeper, commended the concept, saying it would help improve public consciousness of the river's health. The current profile of someone who would swim in the Yarra was "someone who is from overseas, here on a visit, and drunk", he said. But introducing a swimming pool fed by filtered Yarra water would capture the public's imagination. "Particularly if they attached a wetlands to it - it would turn the attention of Melbourne to the river in a fun and ecologically sound way," he said. A concept for a pool on the banks of the Yarra River. Fancy a swim in the Yarra River? Watercraft regulations make it illegal and water quality makes it questionable - especially after it rains - but a not-for-profit group wants to change that by building a floating swimming pool on the river's edge that would cost at least $6 million. The Yarra Swim Co has released a concept design for the pool it suggests could be built on the banks of the Yarra next to Enterprize​ Park, where Melbourne's settlers moored their ship in 1835. The concept was released on Thursday night as part of Australia's Venice Biennale Exhibition, opening this week. The group last year pushed to revive the historic Race to Princes Bridge, a swim competition that ran from the early 1900s to the 1960s, and again in the late 1980s. It argues that waterway pools are a growing concept globally, with plans under way for New York and London. 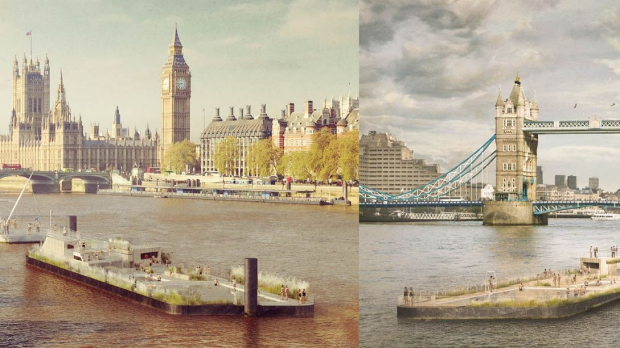 A similar proposal for a swimming pool for the Thames in London. The architect behind London's proposed Thames Baths, Studio Octopi, produced the concept design with Yarra Swim Co. It includes a 25-metre lap pool and a smaller children's play-pool within a planted, floating pontoon. The concept, which engineers Arup have also helped develop, would include locally developed technology allowing river water to supply the pool. Cost estimates for the pool's construction are between $6 million and $8 million. Andrew Kelly, the Yarra Riverkeeper, commended the concept, saying it would help improve public consciousness of the river's health. The current profile of someone who would swim in the Yarra was "someone who is from overseas, here on a visit, and drunk", he said. But introducing a swimming pool fed by filtered Yarra water would capture the public's imagination. "Particularly if they attached a wetlands to it - it would turn the attention of Melbourne to the river in a fun and ecologically sound way," he said. This story Yarra River pool plan first appeared on The Age.